The Joseph Branch, now known as Wallowa Union Railroad, is 63 miles long and connects Elgin in Union County with Joseph in Wallowa County. The railroad uses the pathways of the Grande Ronde and Wallowa Rivers, the waters of which flow into the Snake, then into the Columbia, and eventually the Pacific Ocean. The Joseph Branch was an extension of the original Oregon Railway & Navigation Company (OR & N). The OR & N’s main trunk line through La Grande was completed in 1884. By 1890, the first 23 miles of the Joseph Branch line were laid as an extension to Elgin. North of Elgin the country gets very rugged and it wasn’t until 15 years later that the line was further extended. The completion to Wallowa was celebrated with an excursion train from La Grande to Wallowa in 1908. Between 1,500 and 2,000 people gathered with much fanfare to celebrate the arrival of the first passenger train in Wallowa. 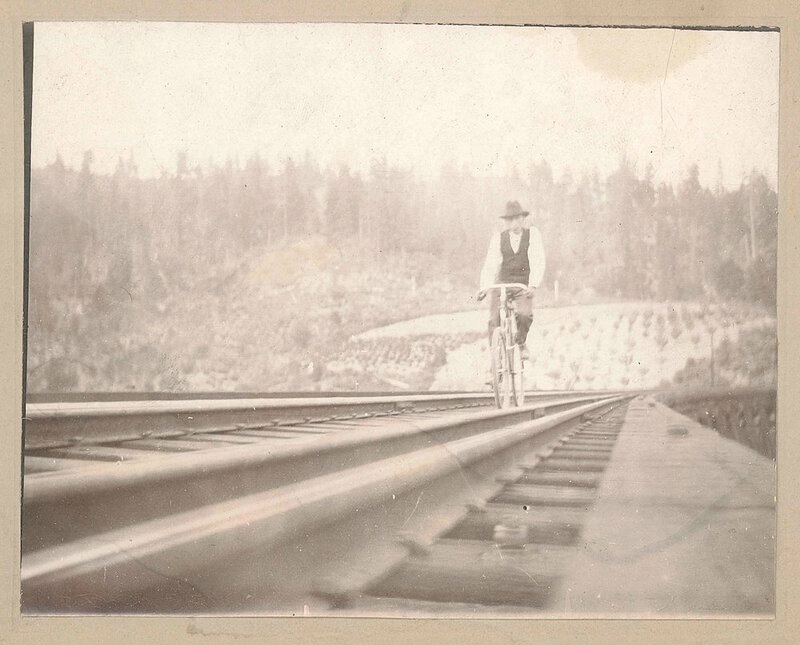 By 1907 the tracks were finished to Joseph in order to access a new grain elevator. Freight business on this line always included lumber, grain and livestock. Between World War I and the Great Depression, the Joseph Branch was used extensively for hauling logs to local saw mills. During the booming 1920s, a daily passenger train served the line with a direct connection at La Grande to and from Portland, Oregon. World War II, the widespread use of automobiles and a state and national system of roads impacted the use of the branch line. By 1949, the Joseph Branch was part of the Oregon Division. Mixed train service over the branch continued through April 1960. The final schedule showed the train operating to Joseph daily except Saturday with the return train operating daily except Sunday. The two trains operated separately with them meeting at the Gulling siding between Elgin and Lookingglass. In 1993, Union Pacific sold the Joseph Branch to Idaho Northern & Pacific for freight service only. By 1996, freight service to Joseph stopped. Abandonment of the line above Elgin was approved by the Surface Transportation Board in April, 1997. After several years of debate on how and whether to rescue the line before it was to be dismantled, the Oregon Legislature authorized $2 million for an intergovernmental partnership between Union and Wallowa Counties to purchase the line and to start its rehabilitation. In 2002, the purchase of the line between Elgin and Joseph was achieved. The Wallowa Union Railroad Authority was formed to govern this line. The first full season of operation for the excursion train was 2004. Today, the Wallowa Union Railroad Authority (Wallowa and Union Counties) owns and operates this short branch rail line. The Friends of the Joseph Branch help operate the train and the Joseph Branch Trail Consortium will operate the trail.